Take the role of a Bridge Officer on board "Not-The-Enterprise". 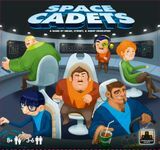 Each player has different minigames to complete in order to successfully fly the starship. The game has been played and the components are undamaged.